Equine Hydrotherapy is based on the therapeutic use of cold sea water over the centuries. It has long been recognised that it has benefits in aiding the treatment of leg injuries, swelling, and diseases in horses. It is known that cold sea water has a positive anti-inflammatory effect on tissues which improves healing and helps to protect against injury. 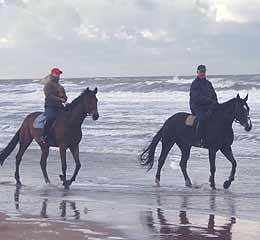 A shining example of this 3 times Grand National winner Red Rum who benefitted from his daily exercise on Southport Beach. Knowing about these benefits inventors have spent about 150 years developing and patenting various machines to replicate the beneficial effects of treatment with cold sea water. This has resulted in several types of swimming pools and spas being manufactured specially for treating horses and ponies . Now that we have equine therapy pools available swimming horses is increasingly becoming part of the training regime for equine athletes. Swimming benefits a horse by conditioning the cardiovascular and muscular systems without putting strain on the joints or subjecting the legs to stress or concussion . As well as being used to fitten horses by providing strenuous exercise, gentle swimming can be used as a method of rehabilitation for horses recovering from an injury. A simple method of equine hydrotherapy, often used in the stableyard to good effect is cold water hosing. A new injury to a horse or pony can benefit from being cold-hosed for about 20 minutes, as many times a day as possible. Hosing for less than 20 minutes isn't so beneficial, as the blood vessels don't have enough time to respond. Although cold water hosing can be fairly effective the water temperature is uncontrolled and may not always be cold enough to affect the tissues involved in an injury. Specially developed swimming pools and equine spas for horses using computer controlled water temperatures can bring even better results than manual cold hosing . Horses treated with cold water spa therapy have shown improvements in conditions ranging from navicular syndromeand laminitis to severe skin lesions. In some cases it appears hoof growth was stimulated. Equine cold water spas with oxygen jets and highly mineralised water have been shown to be particularly useful for healing abrasions and treating tendon problems in horses and ponies. A typical equine spa is a unit with doors at both ends enabling horses to be loaded and unloaded easily. Once the horse has been walked into the unit it is sealed. The spa unit is then slowly filled up with water - this usually takes about 3 minutes. Typically a session will last from 10 - 20 minutes. The spa is then emptied and the horse is walked out. The water temperatures are controlled by computer at between 2 - 4° centigrade. Cold water hydrotherapy works by triggering 3 basic reactions in the horse. The metabolic response of cells in the horse's body is lowered, the cells then need a lower amount of oxygen to function and as a result hypoxic injury is reduced. The permeability of the walls of the horse's blood vessels is reduced by cold hydrotherapy - this reduces the amount of fluid accumulating in the area that is injured. The cold slightly numbs the injury being treated - this acts as an analgesic to this area of tissue. Regular use of a hydrotherapy spa for competition horses can greatly reduce the everyday stresses that have the potential to develop into serious injuries. Using a spa or pool is a more effective and much quicker way of treating tired legs after exercise than hours of cold hosing. These factors combine to improve the horse's circulation and flush away excess toxins and fluids - promoting the heaing of injuries and development of strong new tissue.